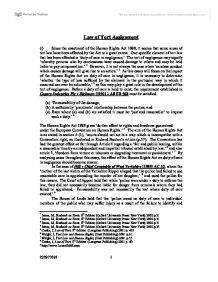 Law of Tort Assignment (i) Since the enactment of the Human Rights Act 1998, it seems that some areas of tort law have been affected by the Act to a great extent. One specific element of tort law that has been affected is 'duty of care in negligence.' The tort of negligence may signify 'whereby persons who by carelessness have caused damage to others and may be held liable to pay compensation.' 1 However, it is not always the case when 'careless conduct which causes damage will give rise to an action.' 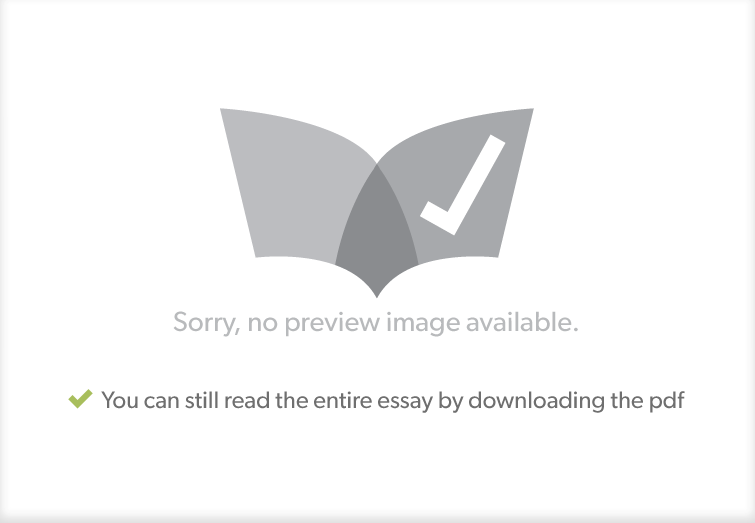 2 As this essay will focus on the impact of the Human Rights Act on duty of care in negligence, it is necessary to determine 'whether the type of loss suffered by the claimant in the particular way in which it occurred can ever be actionable,' 3 as this may play a great role in the development of the tort of negligence. Before a duty of care is held to exist, the requirement established in Caparo Industries Plc v Dickman  1 All ER 568 must be satisfied: (a) 'Foreseeability of the damage; (b) A sufficiently 'proximate' relationship between the parties; and (c) Even where (a) and (b) are satisfied it must be 'just and reasonable' to impose such a duty.' ...read more. In this case, 'allegations of negligence were made against the defendants about the treatment of a child after he had been taken into care. The House of lord held that it was not appropriate to strike out the claim as it was not just and reasonable to impose a duty of care without hearing the evidence.' 22 Therefore the effect of Osman is that in future cases, 'it will no longer be permissible simply to have action struck out on policy grounds as this would contravene Article 6 of the European Convention.' 23 However, there is an objection to the Article 6 view in that 'everyone should get their day in court and it will become much harder for public authorities to settle actions and reduce their costs,' 24 although there is a 'refrain of English negligence law that recognition of a duty of care will open the floodgates of litigation.' 25 The case of Z v United Kingdom 'arose out of the House of lords' decision in X v Bedfordhsire CC  2 AC 633, in that it was not fair, just and reasonable to admit a duty of care.' 26 In Z v UK, the 'European Court of human rights acknowledged that its decision in Osman v UK had proceeded on a misunderstanding of the English tort of negligence and the procedural rules which permit a party to apply to the court to strike out a claim on the basis that it discloses no reasonable cause of action.' ...read more. 2001 p.9 22 Cooke, J, Law of Tort, 5th Edition (Longman Publishing) 2001 p. 43 23 Cooke, J, Law of Tort, 5th Edition (Longman Publishing) 2001 p. 43 24 Cooke, J, Law of Tort, 5th Edition (Longman Publishing) 2001 p. 43 25 Wright, J, Tort Law and Human Rights, (Hart Publishing) 2001 p.44 26 Fairgrieve, D, 'Pushing back the Boundaries of Public Authority liability: Tort Law enters the Classroom,' (2002) Public Law p.300 27 Jones, M, Textbook on Torts, 8th Edition (Oxford University Press: New York) 2002 p.49 28A. C. L. Davies, 'The European Convention and negligence Actions: Osman Reviewed,' (2001) 117 The Law Quarterly Review p. 521 29 Jones, M, Textbook on Torts, 8th Edition (Oxford University Press: New York) 2002 p.49 3028A. C. L. Davies, 'The European Convention and negligence Actions: Osman Reviewed,' (2001) 117 The Law Quarterly Review p. 523 31 A. C. L. Davies, 'The European Convention and negligence Actions: Osman Reviewed,' (2001) 117 The Law Quarterly Review p. 522 32 Kidner, R, Casebook on Torts, 7th Edition (Oxford University Press) 2002 p.70 33Gearty, C. A, 'Unravelling Osman' (2001) 64 The Modern Law Review p. 186 34 Jones, M, Textbook on Torts, 8th Edition (Oxford University Press: New York) 2002 p.43 35 Fairgrieve, D, 'Pushing back the Boundaries of Public Authority liability: Tort Law enters the Classroom,' (2002) Public Law p.301 36 Wright, J, Tort Law and Human Rights, (Hart Publishing) 2001 p.34 1 020973391 ...read more. This is a very good essay. The level of detail is extraordinary. Various policy arguments were put forward in defence of the judgement. These were that conferring a duty of care upon the police might distract them from their important duties and as a result would not make the police more efficient. The case of Lopez Ostra v Spain5 states that "problems such as noxious fumes" constitute a "nuisance type" problem. Based on this authority Jane may find herself liable towards Karl for violating his rights of personal comfort and enjoyment of his home. This was illustrated in Dulieu V White 13 where it distinguished between a primary and secondary victim. A claimant who has direct involvement in the incident and is within the range of foreseeable physical injury would qualify as a primary victim. How Does the Law Justify the Imposition of Strict Liabilty For Some Offences? where a small caterpillar was found in one of he three million tins of peas. However if the court had followed the reasoning in Lim Chin Aik then "d" would not have been liable. Vicarious liability is applied where the law is faced with regulatory offences. However the aspect of reasonableness in some cases has been approached in the same way for both nuisance and negligence, in that the courts will consider the defendants conduct and debate whether or not the defendant foresaw the consequence of his actions. The Mersey Docks principle has enabled the courts to choose between two possible employees. Today, in Viasystems (Tyneside) Limited v Thermal Transfer (Northern) Limited & Others, the principle of double indemnity was introduced. It was considered to be more appropriate to use the principles of double indemnity to share principles between two possible employers.